The IAM is joining the AFL-CIO and other allied unions and organizations in a Stop Fast Track Lobby Day on March 4, 2015 in Washington, DC. 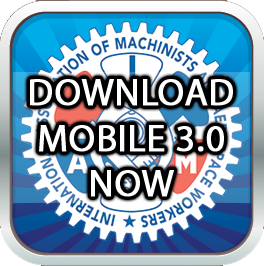 IAM members will be out in force, meeting with U.S. Senators and Representatives to explain why Fast Track and the Trans Pacific Partnership (TPP) trade agreement is shaping up to be a disaster for America’s working families. The Obama administration is moving full steam ahead to complete secret TPP negotiations with 11 Pacific-Rim countries, while working to win “Fast Track” trade authority from Congress. Fast Track means that Congress relinquishes its responsibility to determine trade policy to the administration and will be subjected to limited debate and a straight up or down vote with no amendments when the trade bill comes before them. 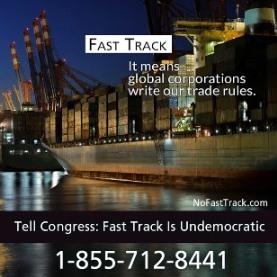 Tell Congress to vote NO on Fast Track for the TPP. Wisconsin Governor Scott Walker and his right-wing army have struck again. Like the first assault, it came without warning. Dismissed as a distraction during Walker’s reelection campaign, the sorely misnamed “right to work” legislation was rushed through the legislature in an “Extraordinary Session” designed to limit debate and shut down opposition. Final passage and a promised signature from the governor are expected by next week. The bill goes to the Assembly floor today; the state’s AFL-CIO has called a noon rally. Walker shocked Wisconsin in 2011 with Act 10, which eliminated virtually all collective bargaining rights for workers in the public sector. He managed to push the bill through only after weeks of vigorous protest. Opponents rallied in the tens of thousands and for a time even occupied the state’s capitol building in Madison. Four years later, thousands of workers again descended on the Capitol to defend their jobs and their state. They were plumbers, electricians, and steelworkers; carpenters, nurses, and ironworkers; laborers, machinists, and teamsters; painters, stagehands, and office professionals; grocery, laundry, and sheet metal workers. They drove from places like Adams-Friendship, Oshkosh, and Menasha. Dressed in hardhats, work boots, Green Bay Packers jerseys, and jeans, at a hastily convened Senate committee hearing February 24 they told riveting personal stories of how the proposed law would hurt their families and communities. They contrasted starkly with the few people who testified in support of the bill—mostly representing business interests or in the pay of right-wing organizations such as the Bradley Foundation. Those men spoke smoothly. They never had to clear their throats or restart sentences. And they wore nice, expensive suits. The hearing ended early, with many citizens still waiting to testify. The majority of senators walked away siding with the men in suits. The next day the full Senate passed the bill 17-15. All Republicans except one voted for it. All Democrats voted against it. A hearing in the Assembly a few days later yielded a slightly longer discussion, but no change in the proposal. Walker’s role is reminiscent of that of Michigan Governor Rick Snyder. Two years ago, after repeatedly calling it a “distraction,” Snyder quickly signed a similar bill, making Michigan the 24th so-called “right to work” state. Wisconsin will be the 25th. It’s not clear what triggered the sudden push. Senate Majority Leader Scott Fitzgerald, a vocal supporter of “right to work,” told local reporters he encountered no resistance when he raised the issue in a recent meeting with Walker. Local leaders and activists speculate at least three factors were likely at work. First, unions and their allies were making inroads against a possible bill. A coalition of over 400 local construction contractors had come together to oppose “right to work,” and was about to start running TV ads. Small business owners, clergy, family farmers, and community members were coming out against it too. Second, pressure from Walker’s financial supporters was building. Out-of-state corporate interests have been funneling dark money into Wisconsin, especially during the recent elections. A video that went viral in 2011 showed billionaire Diane Hendricks asking Walker about becoming a “right to work” state. She gave Walker more than $500,000, the largest campaign donation in Wisconsin history at the time. Walker is already being talked about as a frontrunner for the Republican presidential nomination—and it may take over a billion dollars to win in 2016. That money has to come from somewhere. Pressure also came from the state’s reliably Neanderthal big-business lobby, Wisconsin Manufacturers and Commerce; the Koch-funded Americans for Prosperity, a major player in recent Wisconsin elections; and the American Legislative Exchange Council, which wrote most of the bill. Third, Walker needed to change the subject. His state budget, an extremist wish list for privatization and punishment, was receiving a daily drubbing in the press. His gigantic $300 million cut to the University of Wisconsin wasn’t going down well. Neither was eliminating funds for Wisconsin’s state parks and public broadcasting. Public school budgets were getting slashed again, and unemployment compensation recipients were being asked to pee into a cup to test for drugs. No one but the rich was being spared. Tax cuts for corporations and billionaires have produced the $2.2 billion shortfall. But absent from the governor’s budget explanations were any claims of responsibility. “Wisconsin families can’t afford this. We know how wages fall when this kind of law is passed,” said Yolanda Pillsbury, from Machinists Lodge 873 in Horicon. That point was a focus of worker testimony. Wages fall dramatically in “right to work” states. Families earn $5,000 less per year. The wage gap for women is wider. Worker safety is worse too. According to data from the Bureau of Labor Statistics, the rate of workplace deaths is 54.4 percent higher in states with these laws. Apprenticeship programs and union-sponsored training are being put at risk, many said. “How are people going to get trained if the unions can’t afford to maintain these programs?” asked Pete Stern of Monticello, a member of Ironworkers Local 383. Beth Bacik and her husband John, from the Electrical Workers (IBEW) in Milwaukee, even cited the pope’s support for labor as a reason for rejecting the bill. “We need good wages and benefits. I’ve worked hard all my life,” said Mike Mankowski, from Laborers Local 464 in Madison. He was losing patience with the politicians inside the Capitol. He’s not the only one fed up. Wisconsin is so gerrymandered that in 2012 it only took Republicans 45 percent of the vote to win 55 percent of the Senate seats, and 48 percent of the vote to win 57 percent of the Assembly races. Glenn Schmidt is the managing editor of Union Labor News, the newspaper of the South Central Federation of Labor in Madison, Wisconsin. jobs. These NAFTA-style terms give special benefits to firms that relocate investment and jobs. Since NAFTA and the World Trade Organization, the U.S. has lost 5 million (1 out of every 4) of its manufacturing jobs. All firms operating in any TPP signatory country would get equal access to U.S. procurement contracts, rather than us recycling our tax dollars here to create American jobs. Specifications like “renewable/recycled” or “sweat free” and obligations to meet prevailing wages can be challenged. State agencies would be blocked from buying uniforms that are made overseas under legislation introduced in the Ohio Senate. Sen. Charleta Tavares, D-Columbus, wants to ensure the offices are spending public funds on clothing made in the United States.